UPSC has released score card for Combined Defence Services Exam (I) 2018, All appeared candidates can check their score now. UPSC CDS (I) Score Card 2018: The Union Public Service Commission (UPSC) has declared Marks for Combined Defence Services Exam (I) or CDS (I) 2018 . 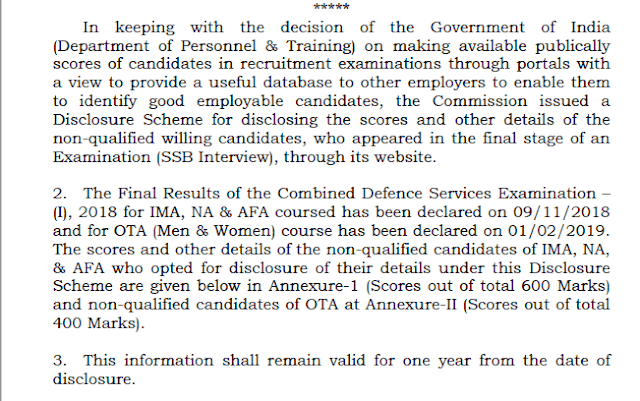 All the candidates who have not qualified the exam can check their score card at the official website of the Commission. The Commission had asked the candidates to give their choice on disclosing their marks in the exam. Under the Commission's "public disclosure mark" scheme, the marks will be used by other government bodies for recruitment ", with a view to provide a useful database to other employers to enable them to identify good employable candidates."